Last Saturday I attended Joey Yap's 2017 Feng Shui and Astrology Seminar at KL Convention Centre. It was a full house event just like previous years. For those who did not have the opportunity to attend, I will try to share as much as I can about what I learnt from the seminar. But first, you need to download your Personal Bazi Chart (PBC) HERE. This is absolutely necessary so that you can follow what I am about to share and to make the information relevant to you. Not exactly sure what is Bazi? Bazi literally means Eight Characters. It's also known as the Four Pillars of Destiny. Read a brief introduction to Bazi HERE. If you do not have your Personal Bazi Chart with you, please download it NOW before continue reading. In Chinese Metaphysics, the universe is divided into 5 elements, namely Wood, Fire, Earth, Metal and Water. Understanding the interactions between these 5 elements is important in the study and implementation of feng shui cures. For 5 Elements 101, read HERE. Below is the Bazi Chart for 2017, the year of the Fire Rooster. Note: Images from the booklet are copyrighted. In the event that I am asked to take them down, I will have no choice but to comply. Metal appears to be the most dominant element in 2017. This is followed by Water, Fire, Wood and lastly, Earth which is the weakest. Now check your PBC. If you have Metal, then this will most likely be a good year for you. If there is no Metal at all in your PBC, then 2017 will be a challenging year for you. Sorry if the photos in this post are not very clear. You may want to magnify the photo or zoom in to be able to read what is shown on the screen. According to Joey Yap, in the year 2017, Earth represents Assets, Water represents Sales, Fire represents Profit, Wood represents Cash and Metal represents Self. Take a look at your PBC. If you have Water, that means you will do well in sales this year. For people who are not in sales, Water can also mean influence. If you have Water in your PBC, this means you are able to influence others. In other words, when you talk, people listen. If you are a boss intending to hire salespersons this year, then it is a good idea to check whether they have Water in their PBC. Do not hire people without Water in their charts. Likewise, if you do not have Water in your PBC, don't be in charge of sales this year. Instead, find other people who have water in their charts and partner them! What if you have Water in your chart and you are not really good in sales? Then it is the perfect time for you to learn how to sell and learn how to influence others. Fire represents Profit in 2017. It also represents accomplishments that may not have anything to do with wealth. If you have Fire in your PBC, and you are running a business, this means your business is likely to be profitable this year. But if you are not in business, Fire in your chart could mean you will accomplish something this year, like climbing a mountain or running a marathon, for example. A profitable business does not neccessarily mean you have cash. Many businesses that are in profit actually experience cash flow problems. Wood represents Cash in 2017. So besides having Fire (profit), you must have Wood (cash) too. Now check your PBC. Do you have Wood? If Wood is on the top of your PBC (Heavenly Stems row), everyone knows you are rich. If Wood is at the bottom (Earthly Branches row), no one knows you are rich. So what do you do when you have extra cash? Joey Yap recommends that you put them back into your self to acquire more assets. The formula outlined in the photo above is, according to Joey Yap, the ultimate way to get wealthy. Earth element is the weakest in 2017. This means resources are low. As Fire counters Metal, those in Metal industries (eg. automobiles) will experience regulatory pressures creating strong competition within. On a personal level, if you have Metal in your PBC, you will experience positive changes as a result of external pressures. Water represents innovation. If you have Water in your PBC, 2017 is a great year to innovate. If you are in business or plan to start a business, know that the key to success is innovation. Without innovation, your business cannot survive for long. This simply means if you have no Water in your chart, do not attempt to start a business in 2017. However, you can get round this by partnering someone who has Water! Water in the PBC also means you can easily find talent or hire the right people. A lot of people who invest in the stock market often ask which stocks to buy. Joey Yap said that since companies are run by people, what you can do is to check the Bazi Chart of the person who runs the company. If that person has Water in his chart, that means he can innovate and his business will thrive this year. Therefore, it would be a good company to invest in. In the 2017 Bazi Chart, Wood is countered by four Metal. This means there will be sudden changes. So if you have a lot of Wood in your PBC, there will be sudden changes in your life this year. An example of sudden change would be moving house. Wood in the chart also represents new leadership and new concept or direction. If you are a CEO of a company and you have Wood in your PBC, then you should come out with a new concept or direction for your company. To summarize, if you have the top three elements - Metal, Water and Fire - in your PBC, this year will be a very good year for you. 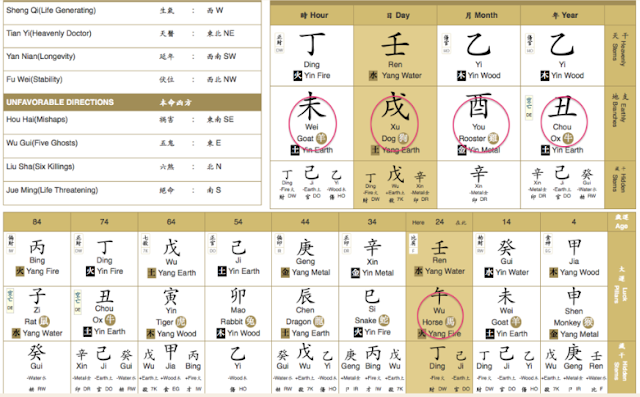 If these three elements are located on the top of your Bazi Chart (Heavenly Stems), you are very likely to earn Dumb Money this year! What is Dumb money? It is money that you earn without you knowing exactly how you earned it. The opposite is Smart Money - money that you earn by working hard and following a specific way. Most people get rich via Smart Money. But who would resist Dumb Money? Not me! So check your PBC - are you among the few lucky ones to have dumb money this year? Based on the 2017 Bazi Chart, there is a Metal and Fire clash. This means people are generally not optimistic. But they are more united against people in command. I take this to mean that in countries where the citizens are against the policies set by their leaders, they will tend to group together to oppose their leaders. The clash between Metal and Fire in the chart also means that uncertainties will increase. More people will lose their jobs. Spending on infrastructure will increase globally. However, there will be much less spending on the environment. Wood and Earth both represent the environment. Since there is Metal chop Wood in the Chart, and Earth is also the weakest element in 2017, these are indications that there will be more environmental disasters in 2017. The presence of both yin and yang Metal in the Chart indicates tension. Security wise, there will be more incidences of terrorism. However, Joey Yap said if you have the top three elements - Metal, Water and Fire - in your PBC, you have no cause for worry about terrorism. However, if you have lots of Earth (weakest element in 2017) in your PBC, better stay at home to be safe. I am sure he's just joking! Haha. Water in the Chart represents wisdom. Since Water is the second strongest element in 2017, there will be more people moving into education and academic fields. To predict the economic outlook for Malaysia, Joey Yap compares the Fire Rooster Bazi Chart of 1957 (the year Malaysia achieved independence) with the 2017 Bazi Chart. The result? Entertainment line will be good. Starting a new business in the entertainment field may be a good idea. There will be challenges in the financial industry due to regulatory issues. 2017 will be a great year for IT (Information Technology), so those in the IT line will find it rewarding. This also means that doing an online business may prove to be rewarding in 2017. Most likely calamity to befall Malaysia in 2017 is the haze. Looks like this problem will never be solved, will it? Other calamities include flood, typhoon, health epidemics, tsunami, explosions and terrorism. Joey Yap however stressed that tsunami is very unlikely to happen. During the seminar, Joey Yap also shared about 5 ways to succeed in life. The 5 ways are Luck, Choices, Strategy, Environment and Skills. It is indeed very rare to have good luck in everything. But even if you have good luck, that is not enough. You need to also make the right choices in life. The purpose of studying Chinese Metaphysics or getting a Bazi Reading is so that you know what your choices are. When you know your choices, you then make better decisions. The right decision can make a whole world of difference to whether you succeed or fail in life. According to Joey Yap, luck is a form of qi (energy). To have good luck, you need to have high energy. High energy simply means you see positiveness, and see the good in everything. When you vibrate in the positive energy, you will also attract people with positive energy. Luck is however only one of the five ways. Other game changers are making the right choices, having a strategy, changing your environment and learning a skill. According to Joey Yap, the year 2017 is a very unique year for health. Rooster (especially Fire Rooster) when combined with Fire element in the 2017 Bazi Chart represents medicine. There is a good chance of medical breakthrough happening in 2017. Perhaps a cure for a currently uncured illness will be found. It is also a good year to do a medical check-up especially if you already having health problems. Metal represents respiratory and breathing, so there will be more cases of respiratory problems in 2017. Ding Fire represents the heart, so there will be more cases of cardiovascular diseases. Rooster and Rabbit clash in the chart indicates gynaecology and childbirth issues. An example is cyst in the ovaries. Wood represents joints and bones, so there may be health problems related to these in 2017. All these also means that doctors, healers and those in the medical field would probably have a financially rewarding year especially if they are dealing with the health issues related to respiratory, cardiovascular, gynaecology and bones. Take a look at your PBC. Notice the chart is divided into four pillars - the Year, Month, Day and Hour pillars. Now that you know what are the positive elements for 2017 (which are Metal, Water and Fire), see where they are located in your PBC. If they are located in your Year and Month pillars, focus on your career and social life. If they are located in your Day and Hour pillars, focus on your home, family and relationships. 1. Game changing technology for IT. A good industry to be in. Starting an online business is highly recommended. 2. Medical breakthrough. Good year to do medical check-up. 3. Revolution. Change of leaderships. Citizens unite against leaders or people who set the rules. 4. Bumpy, choppy year. Metal chop wood. Won't be a smooth sailing year. 5. Problematic. Earth element weak, therefore resources are low. People don't see solution. If you see the solution, you win in 2017. 6. Employment will decrease. People losing jobs. But this also means easier to hire people and hire talents - an advantage for those starting a business. 7. Luck is only one of the 5 ways to succeed in 2017 and beyond. There are 4 more things (if you are willing to work at it) - choices, strategy, environment and skills - to make 2017 a great year for you! If majority of the elements in your PBC are good (ie. Metal, Water and Fire), go forward and do something out of the ordinary this year. If you don't, you are wasting your good luck. Remember if you do exactly the same as what you did last year, nothing will happen. If majority of the elements in your PBC are not good (ie. having 2 - 4 Earth elements), lay low and consolidate. Do not start a new venture or take risks. If you have half good and half bad elements in your PBC, try and combine with a partner who have the good elements in his or her PBC. In Part 2, I will be sharing about the 12 animal signs and the stars that come with each this year so that when you have these animals in your PBC, (note that you have one animal sign in each of your four pillars in the Bazi Chart) you will then know what to expect for 2017 and how to make full use of what you know. Stay tuned!